NNSA and partners launch project to reduce use of radioactive source-based devices in New York City, October 12, 2017 or PDF. Recovering Radioactive Nuclear Sources, Steven Aftergood, Secrecy News, Federation of American Scientists, December 21, 2017 or PDF. 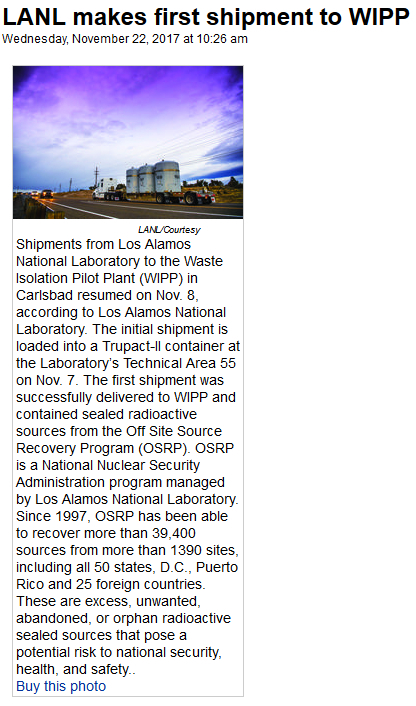 LANL makes first shipment to WIPP, Wednesday November 22, 2017, Los Alamos Monitor, or PDF. Environment Ministry Holds Seminar on Strengthening Nuclear Energy and Radiation Regulations; Gibbs, Gina; October 31, 2017; Bahamas Information Services or PDF. Cradle-to-Grave Control in New Caribbean IAEA Member States, Tuesday 25 April 2017, Kirsten Virginia Glenn, IAEA Department of Technical Cooperation or PDF.